Sanjay Gandhi National Park (SGNP) is said to be the lungs of Mumbai and provides the bustling metropolis with clean drinking water among other ecosystem services. Biologically rich, SGNP is often in the news as the site of conflict between people and wildlife, mainly leopards. The forest department of SGNP has taken a proactive step to help manage the park better, mitigate conflicts and engage with the interested citizens of Mumbai. The Forest department has launched a project called ‘Mumbaikars for SGNP‘ to assess and assist leopard conservation and mitigate man-animal conflict in and around the park, by involving scientists, students and other members of the civil society. The project will be carried out by the Forest Department and the Centre for Wildlife Studies (CWS), Bangalore. The main objective of the project is to use basic scientific methods and involve interested people in Mumbai to better understand the beauty, importance and challenges the leopards and the Park face, in an effort to focus positive action by Mumbaikars to better manage the park. 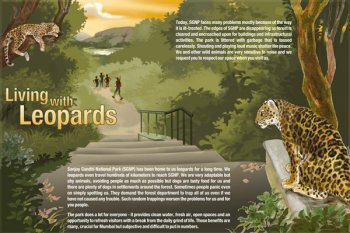 One such initiative of the project is the attached poster to increase awareness on how to deal with leopards in and around human-dominated areas, typically on the periphery of the park. Often, the interaction between leopards and humans depends on how the human/s react to the presence of the leopard. The best practices in dealing with leopards has been presented in this poster.